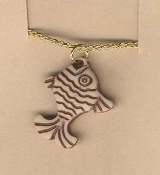 Funky Tan Color PRIMITIVE FISH PENDANT NECKLACE Retro Boho Chic Novelty Charms Costume Jewelry - Hippie style PLASTIC Fishing Charm with African, Native American Ethnic Faux Clay Bone Look. Interesting for fisherman, luau party favor, beach lover or scuba diver! Approx 1-inch (2.5cm) Long on 18-inch (45cm) Neck Chain with safety clasp.